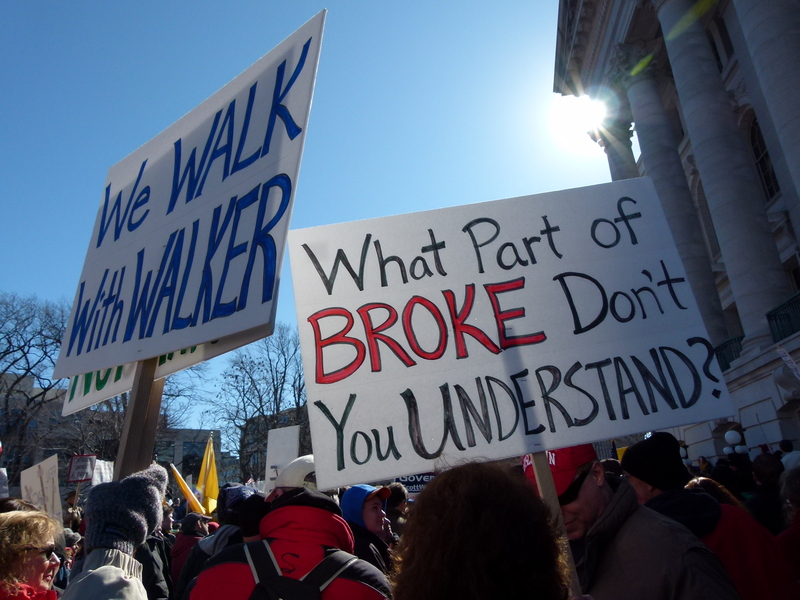 After a week of protesters rallying in Madison, supporters of the Budget Repair bill have their say over the weekend. Security separates opponents from the supporters, with many folks on the muddy grass. One man would much rather discuss the facts rather than put up with the hyperbole from our elected leaders — on both sides. He calls that an “inability to coherently express a point of view,” especially, he says, when they compare leadership to Hitler, bigots, warmongers, etc. Another man follows politics, but doesn’t let it weigh him down too much. He sings a little ditty, encouraging the missing senators to return to the capitol. Saturday’s competing rallies resulted in the biggest crowd yet over the past week, with official estimates between 55,000-70,000.